Play Ultimate with Thurgood Marshall’s Co-ed Teams! Ultimate is one of the fastest growing sports in the USA and is played in more than 42 countries. In Seattle, there is a large community of Ultimate players, with leagues for elementary, middle, high school, college and adult players. Thurgood Marshall started a team in 2012 and fields multiple teams each spring. The citywide league is for players in Grades 3, 4 and 5. Watch Pup Press for the upcoming season’s information. 2019 Practices: 3:30-5:00, Tuesdays and Thursdays (February 26 through mid-May). 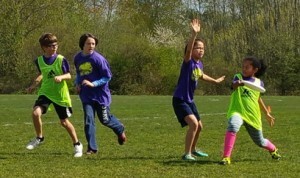 2019 Games against teams from other elementary schools: Saturdays (March 9 through mid-May). Download this signup form (sent home on Jan. 22). There is a $60 fee to participate, but financial assistance is available. Deadline to return to TM’s main office: Feb. 6. Questions? Contact Baird Johnson at baird.m.johnson@gmail.com. Ultimate is a non-contact, team sport played on a field similar to a football field. A point begins with each team (of usually 7 players) standing on opposing front end zone lines, and one team throwing the disc (Frisbee) to the other team. Points are scored when a team catches the disc in the opponent’s end zone. The disc is moved by completing a pass to a teammate. You cannot run with the Frisbee. The thrower must throw the disc before the defender “marking” the thrower counts to 10. During a point, play is continuous until one team scores a point, with possession of the disc changing from one team to the other any time the disc is intercepted, dropped, or lands out of bounds. There are no referees. Players make all the foul calls and resolve all the conflicts on the field. Ultimate is guided by The Spirit of the Game, where the responsibility to play by the rules falls upon the players.